Do you have some curious woodland critters invading your home, destroying your property, and causing you unwanted stress? It is not uncommon for these creatures to seek shelter in the comfort of your home. Squirrels are especially known for getting inside your home. There are two common types of squirrels throughout our area, both of which can wreak havoc on your belongings and trigger lots of problems. Learn more about these types below, then count on our team of experts to help you remove them from your home. In no time, your home will be pest and wildlife free, allowing you the peace of mind you deserve. 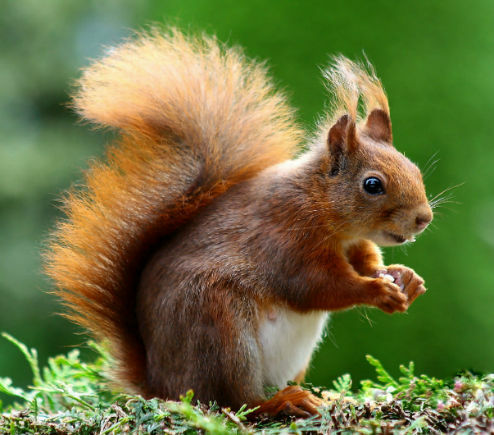 Gray squirrels are the ones you typically see running around your yard or local park. They are larger in size with fluffy tails, which they use to help keep their balance as they jump between trees. They are known for gnawing their way through anything, and that includes getting into your home. Some of the holes they form are as large as a softball. Between dragging in debris, chewing up your home, and leaving urine stains and droppings, they can cause damage fast! They also attract fleas and other pests in your home. Having them in your home is a nuisance, so there is no doubt getting them out is vital. Flying squirrels are not as big as their bushy-tailed relatives, and they are known for entering your home through tiny spaces and openings. These little fellows are nocturnal, so you might hear them scampering around your attic or crawlspace during the nighttime. They are also known for gliding easily through the air, thanks to their parachute-like skin that connects their hindquarters with their forequarters. Flying squirrels can cause a lot of damage to your home. Both breeds nest twice a year, having babies near the end of spring and the winter. If you have squirrels setting up camp around this time of year, you will want to get them out in a hurry! When it comes to removing wildlife and pests from your home, we know our stuff, and we are ready and eager to help. We are licensed, insured, and equipped with over two decades of experience. You can rest easy when we’ve got your back! We will remove any animals we find as humanely as possible and relocate them to an appropriate environment. Get the care, attention, and professionalism you deserve by working with our team. We are ready to take your call today. PreviousPrevious post:Why Leave Attic Remediation to the ProfessionalsNextNext post:How Do Mice & Rats Enter My Home? How Do Mice & Rats Enter My Home?